That said, there were exceptions: the experimental psychedelia of “Don’t Come Around Here No More” was certainly Beatles-derived, and his 1996 single “Walls (Circus)” was the most overtly Beatlesque thing he ever did. And while you would expect Petty to aim for the Hard Day’s Night / Rubber Soul era, instead, “Walls (Circus)” instead goes for their late 1967 / early 1968 sound, keyboard-driven, cello-accented, unexpected vocal arrangements, a 12-string solo echoing the verse melody and finally, a false ending that turns into a big coda with sound effects. All of which, of course, was centered around a chorus that was as pure pop as any he’d ever written. 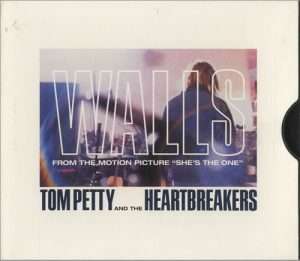 With Lindsay Buckingham doing the echoing on that chorus, “Walls (Circus)” now seems like it should have been a huge smash, but instead it was the first time since 1978 that at least one Tom Petty single from his most recent album didn’t make the top 30. Maybe because it was too far off brand, maybe because radio was suddenly less friendly to someone like Tom Petty after 20 years, maybe because nobody was quite sure to make of Tom Petty and The Heartbreakers doing the soundtrack to the second film from a relatively unknown filmmaker, but “Walls (Circus)” and indeed, the whole She’s The One soundtrack are a bit of a under appreciated chapter in Petty’s career.